In the mountains of central Nara Prefecture, once the stronghold of the Yamato Dynasty that ruled Japan in the third century, there is a cluster of human-made forests that have endured for over 500 years. These are considered to be some of the oldest, privately funded, plantation forests not only within Japan but worldwide. Yoshino forestry developed along the Yoshino River (also known as the Kino River once it enters Wakayama Prefecture downstream) in the Nara villages of Kawakami, Kurotaki and East Yoshino. The region was likely chosen due to its wet climate, which is suitable for Japanese cedar trees, and also because large quantities of construction material were needed as Japan’s capital underwent numerous relocations. The region continues to produce large-scale cedar and cypress lumber of the highest quality, i.e., fine-grained, even-toned and with few knots. While other regions in Japan plant seedlings around 2 metres apart, here, as much as three to four times more seedlings are planted in a dense mass with only a metre in between each tree. This suppresses the speed of growth resulting in dense wood grain and creates straight trunks that are uniform in size from base to tip. In addition, they are thinned repeatedly and are carefully tended over the course of 200 years until they are harvested. These human-made forests were developed in the early 16th century and by the 18th century they began to be used to create a wider variety of products such as sake-barrels. This was also when the systems of high-density planting, frequent thinning and long-term cutting cycles were established in order to manage the forests. Meanwhile, landowners facing financial difficulties began selling the rights of their mountains to the lords of the central Yamato basin. This gave rise to a unique system found only in the Yoshino area: the relationship between yamamori (those who work in the mountains) to yamamochi (those who hold ownership). Throughout the rampant deforestation that occurred both in Japan and around the world in the early 19th century, the Yoshino region managed to preserve its old-growth trees. In the late 19th century, lumber production surged as wood prices soared. Following the forced deforestation by government during and after World War II and the steep rise in the value of forests during Japan’s economic boom of the mid-50s and 60s, the region has been in decline. In the villages of Kawakami, Kurotaki and East Yoshino, nearly half of the trees were planted in the 60s during a period of heightened regeneration efforts. However, there are still over 1,000 hectares of old-growth trees aged 100 years or more in addition to many that have been carefully cared for, by hand, for 200 to 250 years. The acreage of 100 year-old trees is expected to increase to 3,000 hectares by 2020 and to nearly 7,000 hectares by 2030. As the Our World 2.0 video-brief that accompanies this article shows, driving up Nara’s Mount Okasei in an all-terrain vehicle is challenging given the small spur road is 2.5 meters wide with a 1.5 metre high side wall carved into the mountainside. Constructed 30 years ago by forester Kiyochika Okabayashi and his brother, the road is now a remarkable 78,000 metres and winds along steep slopes. It is supported by a double layer of wooden beams buried underneath dirt and easily handles 2 tonne dump trucks as they haul 260 year-old trees down the mountain. The side wall is covered with moss and plants and the small logs that reinforce it are unnoticeable, as the road blends into the mountain. 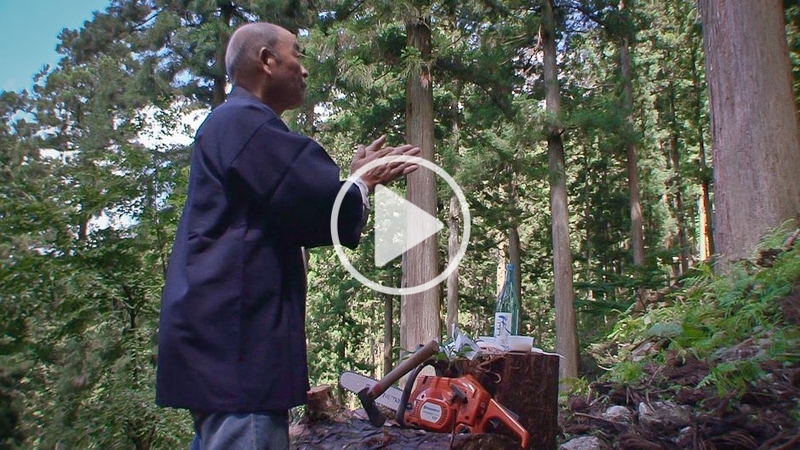 “Heavenly spirits we offer this prayer to the mountain gods,” says 74 year-old Akinaga Matsuo as he offers a Shinto wish before getting to work. He is a somabito (one who works in the mountains) and descends from one of four families that have remained yamamori for over two centuries. To fell a tree, Matsuo first makes a “notch” in the trunk on the mountain side. This is followed by a “backcut” made into the opposite side at a point higher than the first notch. A wire rope is wrapped around the tree and a tow truck pulls it. The creaking starts as additional pressure is added by hand and eventually the large cedar begins to sway. After some back and forth movement, with a great boom, the large cedar topples right on target, between two other mighty trees. “This is still only ‘thinning’ and not the actual harvest. We will let the remaining cedar grow further until the main harvest,” Matsuo says, explaining how Yoshino forestry works. The Okabayashi family once governed the entire Yamato Basin area, which they proudly referred to as “Kunnaka” (the centre of Japan.) With 1,900 hectares, the Okayabashis held the third largest yamamochi in the Yoshino forestry district, employing up to 70 yamamori at one time. Interestingly, the late 16th generation Kiyochika (the Okabayashi brothers’ father) was known as “the emperor of Yoshino” and is said to have entered his own mountains only twice in his lifetime. His son, the current Kiyochika, is now 61 years old. After college, he studied modern forestry that relied on machines in the mountains of Gifu Prefecture. Then at just 29, along with his brother, he attempted to build a skid road into his mountain but the road built by the contractors he hired crumbled quickly. The reason for this was that not only is the area well-known as the wettest place in Japan but it is the most geologically challenging place in the country as well, possessing numerous fracture zones. Unsurprisingly, building a skid road here was impossible and the Okayabashi brothers were finding it hard to transcend the idea, put forward by local yamamori, that landowners could not handle mountain work. It was around then that the Okayabashi brothers met Keizaburo Ohashi, an expert in plantation forestry from Osaka. The roads he built into his own mountains 20 years before were still thriving. Thanks to the technique they learned from Ohashi, today, getting up the Okayabashis’ mountain is just an easy drive. Furthermore, in recognition that their roads are built with the utmost care, skid roads will now be built in even more remote mountains where logging previously had to rely on helicopters that are very costly to employ. Much of the wood imported into Japan is imported by small-sized private contractors who build nearly 80% of single-family homes. Last year, Okabayashi became a member of the Forestry Agency’s committee for “networks and skid roads” and this type of road, formerly classified as private, now benefits from government funding. The hope is that these contractors will instead be enabled to supply their clients via Japanese mountains that have been equipped with the “indestructible skid roads” that Okabayashi developed. With the help of the finest road-making skills in Japan and drawing from Yoshino forest’s 500 years of experience, yamamochi and yamamori can work together to spread these skid roads throughout the Yoshino area and Japan. Mountain Logging Roads Pave the Way for Yoshino Forestry by Reiko Amano is licensed under a Creative Commons Attribution-NonCommercial-ShareAlike 3.0 Unported License. This article gives me hope that Japan can become increasingly self-sufficient in forest products while doing so with great care and respect for the land and ecosystems. As a boy I used to spend summers at my uncle’s lumber company, riding in log trucks, watching fellers, being bounced around mercilessly in the tractors negotiating the steep terrain around redwood trees along the Pacific Coast in California. My uncle’s company, Big Creek Lumber, was renowned for its “selective harvesting” techniques (rather than clear-cutting) and road-building care so as not to damage the forests. As a result of my experiences in the woods watching these experts at work, I have great respect for skilled road-making and care of the land. I’m especially pleased to learn about this activity in Japan. Thank you, Amano san, for helping educate us. I like the story very much and am interested in it. I hope more and more people know the importance of right way to maintain the forest and nature there. One thing I AM very dissapointed by the article is… It’s not Okabayashi! It’s Okahashi!! very interesting and encouraging that Japan is thinking how to make use of its own bounty of wood rather than import from other countries (which has sadly been a case of much importing from endangered rainforest areas).